One CSTEP student presented her research at the CSTEP Statewide Conference (April 7-9, 2017). We continue to have a very to have a strong interest from our CSTEP students to serve as mentors to our STEP participants in our Saturday STEP program. There are currently fourteen (14) CSTEP students serving in this capacity. During the summer of 2017, three (3) CSTEP students participated in the 2017 Brookhaven National Laboratory CSTEP Mini-semester; three (3) CSTEP students participated in Stony Brook University’s (SBU) Garcia REU and one CSTEP students participated in the Stony Brook University Nanotechnology REU.Finally, six of our CSTEP students are also current NSF-S-STEM scholarship awardees at SCCC. 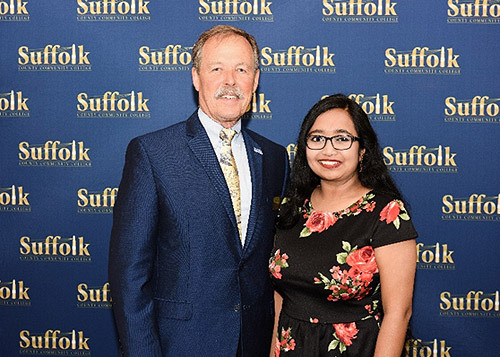 Finally, five students each from STEP and CSTEP participated in a STEM Celebration Dinner with NASA Astronaut Commander/SCCC Alumnus Hoot Gibson on May 22, 2017. 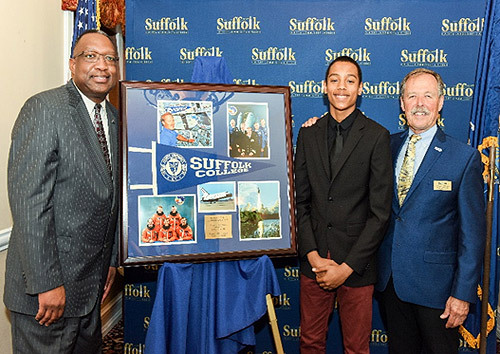 (l-r, Dr. Shaun L. McKay, President Suffolk County Community College; Tristan Moreau, STEP student; NASA Astronaut Commander/SCCC Alumnus Hoot Gibson). (l-r, NASA Astronaut Commander/SCCC Alumnus Hoot Gibson; Malmi Kiriwandalage, CSTEP student).